As scientists work on better climate models to help us deal with global warming, there are only two places to gather more data: the present and the past. The present crawls along at its usual pace, producing its daily trickle of information, but the past promises to yield buckets of data in the right archives. 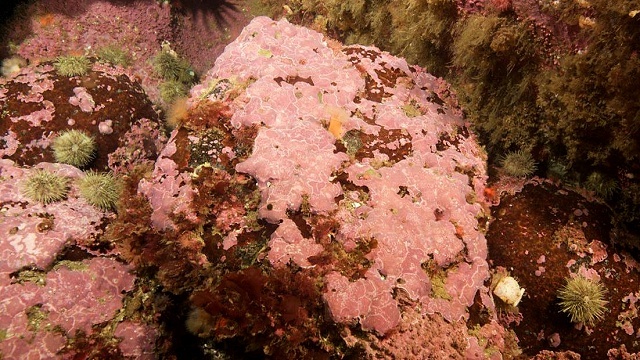 A new paper has opened up a long-needed archive for the high northern ocean, recorded in the annual "tree rings" of red coralline algae. The tropical corals most of us are familar with are stony structures, built out of the dissolved minerals in seawater, that are occupied by colonies of tiny animals. But outside the tropics, coral-like structures are built by various species of algae—colonies of one-celled plants. The red coralline alga Clathromorphum compactum lives on the cold shallow seafloors around the Arctic Ocean and slowly but steadily puts on annual layers as reliably as treetrunks. A paper published this week in the Proceedings of the National Academy of Science reports a record of annual sea ice in northeastern Canada, based on C. compactum layers, that goes back 646 years. This organism joins a select list of "climate proxy" species that include tropical corals, sclerosponges, bristlecones and other trees. Along with annual-scale records from other climate proxies, including lake sediments and ice from the polar ice caps and tropical glaciers, we can splice together pictures of prehistoric climate that are accurate enough to use in detailed climate modeling. Every climate proxy has its own quirks that can be turned into information. Tree rings vary with the species, the region, and the individual seasons of each year. Glacier ice captures dust from the air, and bubbles of the ancient air itself. In the case of C. compactum, which lives at 20-meter depths all around the northern seas, the red alga grows at a rate that responds closely to water temperature. Not just the growth rate, but the chemistry of its mineral layer correlates with temperature—more magnesium enters the calcium-carbonate material during warmer weather. And then when sea ice forms, the alga shuts down entirely, thus its annual layers are also a sensitive indicator of the icy season. While tree rings are usually wide enough to measure with calipers under a low-power microscope, the coralline algae layers are measured in microns. The paper's authors used electron microscopic techniques to image the layers and analyze their chemistry. They also collected many specimens ranging from Maine to Arctic Bay, at the north end of Baffin Island, and painstakingly assembled a year-by-year record of ice cover in these waters. The ice record matches what we know and what we suspect from other sources. Notably, during the "little ice age" period from about 1450 to about 1850, thick and long-lasting sea ice corresponded with the spread of cultures based on seal hunting. Since 1850, the sea ice has undergone "a long-term decline distinctly steeper than at any time since the 14th century." Throughout this time period, sea ice has been highly variable. Not so long ago, there was a lot of chatter each year about the fluctuations of the annual Antarctic ozone hole, and then the world took action against the chlorofluorocarbons that were eroding it. Since then the ozone hole has been recovering, gradually and with wide variations, without a lot of discussion. It's worth remembering as we watch the Arctic sea ice today through satellite imagery. Instead of cheering or bemoaning the state of the ice every year, we would do better to keep our eye on the long-term trend—and long-term action.